Matthew 6:28-30 – And why are you anxious about clothing? Consider the lilies of the field, how they grow: they neither toil nor spin, 29 yet I tell you, even Solomon in all his glory was not arrayed like one of these. 30 But if God so clothes the grass of the field, which today is alive and tomorrow is thrown into the oven, will he not much more clothe you, O you of little faith? Glacier lilies along the trail to Iceberg Lake. Glacier National Park, Montana. Even though our faith is not earned, we still have a responsibility to care for this precious gift we have been given through Christ. Without water and sunshine the lilies will not grow, neither will our faith without proper nurturing. One way our faith grows is through diligent study of God’s word. Romans 10:17 tells us that “faith comes from hearing, and hearing through the word of Christ.” So, not only can God relieve our worries through the assurances provided in his word, he also uses it as a means to mature our faith, which is our best armor against anxiety. Look at how magnificently these glacier lilies proclaim the glory of God. He has provided the rain and sunshine needed for them to blossom. How much more will our faith blossom and glorify him if we avail ourselves regularly of the great gift of his word? 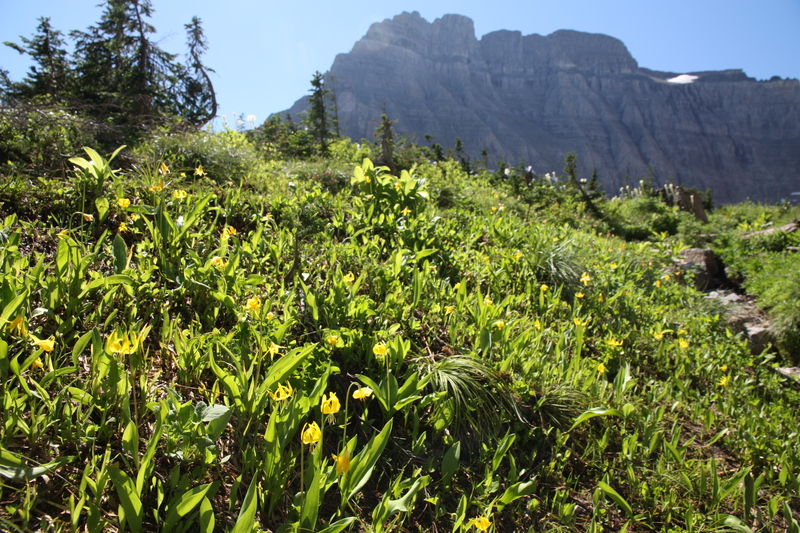 This entry was posted in God is Revealed... and tagged Christ, Glacier lilies, Glacier lily, Glacier National Park, God, Gospel of Matthew, Iceberg Lake, Jesus, Matthew 6, Montana, Sermon on the Mount by Todd D. Nystrom. Bookmark the permalink. We can also ask God in prayer for an increase in faith (Luke 17:5). Reading God’s word is good, but note Paul says, “faith comes through hearing.” He didn’t say reading. Hearing God’s Word proclaimed in the liturgy is another great way to grow in faith. (Combined with reading, even better!) I must admit these passages are some of the most troublesome for me as I am prone to fear and anxiety. Thank you for these posts. They are wonderful. So true, all three of these means of grace are critical to our growth as Christians. Neglecting any of them will keep our faith from increasing the way God would desire. Thank you for the kind words! I am glad you are enjoying the posts.